Today's the day I share with you thoughts which have been rolling around in my head for a very long time. For your convenience, I'm offering a short version. I’m in a show. You should come see the show. 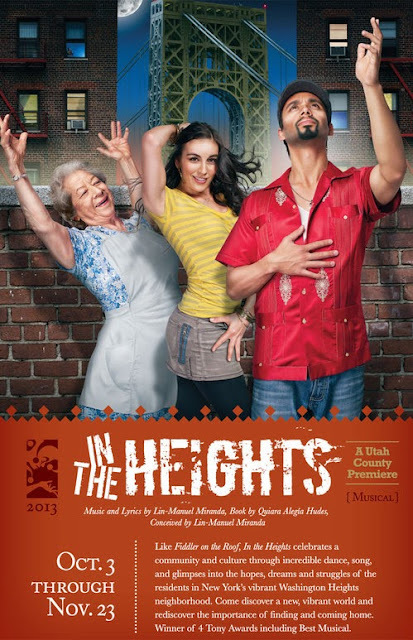 Check out the 'In The Heights' image on my sidebar for tickets. But if you feel so inclined to find out the details, I'm sharing the history because this really means a lot to me. You’ll remember that the Ignite presentation I gave at evo12 was called ‘Evolution of a Dream.’ You also may remember that when I was listing the things I wanted to be when I grew up, the first one I mentioned (after Wonder Woman, referencing the picture of myself in underoos) was that I wanted to be on Broadway (0:58). It’s a dream that wasn’t beyond reach at one point in my life. I’ve learned as an adult – and it’s one of the hardest pills to swallow for a college dropout – that no one cares what you did in high school. Let me rephrase that: most people don’t care. Some people do. I do. But maybe that’s because I’m a college dropout. That being said, I’m going to give you some background, and it has to do with high school. When I was in high school, I was really good at musical theater. (Really good? Is that how to phrase it?) I loved being on stage. Toward the end of my junior year in high school (we had done Fiddler on the Roof that year, I was Hodel), I received a letter, and a phone call, from AMDA, which is a performing arts school on Broadway. They asked me to come to the city for an audition. When I told them that I was only a junior, they apologized (they thought I was a senior), and said they’d call again the following year, which they did. I got the phone call after we finished Guys & Dolls (I was Adelaide). I remember being so excited at the thought of it; I also remember telling my mom, who scoffed, “Like I have any money to take you to New York City.” It was a six-hour drive to the city, but I simply couldn’t get there. And with that, I didn’t audition for AMDA. Over the years, I’ve wondered about that scenario. I've wondered if AMDA was a credible institution (it is). I’ve wondered if credible institutions really recruit students (they do). And I’ve wondered if I was really all that talented – then, ever, and currently. I ended up moving to Utah at age 19. I got married at 20, first baby at 22. My life has been intentional. I am not sorry that I’ve done what I have with my life. Still, I’ve always wondered if anything could have – would have – come of it. I told myself that I had made the ‘right’ choice – becoming a mother. Never did it enter my mind that I could be a mom and continue to act. For years I didn’t see any shows. It was too painful. Truly. When I did start attending plays and musicals again (slowly) it took a while for my emotions to not boil over with jealousy of those on stage. Imagine – imagine! – my reaction when, upon reading the bios in the playbills, I saw things like, studied at AMDA in New York City, and, is a mother to three young children. I began to doubt myself and think I hadn't used my talents the way I should have, and that it was too late. Add to the doubt people telling me, straight up, that they don’t think I sing very well and my doubt swelled to bigger than I could bear. Why hadn’t anyone told me that I could be a mom AND be on stage? I was so disappointed in myself, which was supremely conflicting. I am someone who loves being with her kids, so why was I feeling like I had missed the boat, like I had failed? Just because I didn’t live one of my dreams didn’t mean I wasn’t living another because, indeed, I was (and am). That phone call changed my life because it changed my perspective. That day I wiped my tears and knew I’d get back on stage. Since that time, dance has reentered my life (as evidenced by my Ignite presentation/flashmob, among other things). Confidence has made an appearance as well in the form of not paying attention to the few people who say they don’t like how I sing, and instead paying attention to the scores of people who have complimented and encouraged my talents. Almost a year ago, I heard that In the Heights was coming to a local theater, and I knew. I knew it was time. Darin has been done with his doctoral work for two years. My youngest kid is starting school this year. I’ve been dancing. It's time. Darin was, has been, and is, completely supportive. I decided to prepare for the audition. Beginning last December, I got to work. I learned everything I could about the auditioning process. I started taking voice lessons. I put together a headshot and résumé. Then, in June, I auditioned. It was my first stage audition in 18 years. And here we are. We’ve been rehearsing for about a month. The process is fascinating and enjoyable and I’m grateful every day to be a part of it. There’s one last piece to this, though. Here I am: I find myself living so many dreams, overwhelmed with gratitude for being able to have the life I do, my family and my job . . . and then I add to it that I can fit this other old/new dream into my life, humbled that I’ve been cast among such professional, stellar talent, in an amazing show. Having taken an 18-year break, getting to use my talents, it’s all very healing and helpful in helping me make more discoveries about myself and potential. And with ALL of that, I will overcome an obstacle that I didn’t know I could. I will perform on Opening Night, which is October 3rd. Taylor's birthday. Thirteen years later, I won't be shut away from the world. My mourning will be private because I will be on stage. Back on stage. It’s a step of healing I never could have imagined. Thanks for reading, and I hope to see you there. Fabulous story, Jenny. That is what life is all about: finding the courage, doing the work, making the dream.I only wish I could be there to see you. You are amazing!!! Good luck and have the time of your life!!! I love this post! Congrats. It is inspiring to hear of a mom living her dreams. Oh I would love to go! So proud and excited for you. Jenny! I didn't know the back story. Wow! I am thrilled for you. THRILLED! I can't wait to see the show and clap until my palms burn. Yay for you! I'm so excited for you to be in a play! Good for you. Thank you for sharing this process with me, in many ways. In the least condescending way possible, I am so proud of you. I might have teared up when I read this. Lovely. Thanks. AND I CAN'T WAIT TO SEE IT!!! This makes me so happy! I've had a similar 'longing' since my first year of college (a hundred years ago), it's inspiring to see that you are living your dream. We are going to come see you! I am so excited for you. She is headed there this fall. I loved theater in H.S. too! Looks like a great show! Love the Hale! So fun!! I wish I lived closer to come see you. I'm afraid you've really set the wheels turning in my mind about what I should or could be doing... besides being a mother. Of course I love my life, but lately I've been feeling the tug of "didn't I used to be a person, too?" Kind of a scary thought. You're inspiring! I'm sobbing. I'm so happy for you! I wish I lived closer and could come and see you, but I'm cheering you on from all the way across the country! Congratulations! This really touched home with me. My daughter is a theater arts major in college right now - a junior - although she enjoys the work on the sets more than on the stage. It's not easy to set aside your dreams for your family & it is so wonderful that you have made yours come true! I'm so happy for you, what an adventure! I wish that darned ocean wasn't between us and I could come see you on stage. Your'e living the dream and believing in yourself, that is huge. I'm so excited for you, Jenny! You are seriousely awsome. Maybe we can swing an Orem date night and come see your show! @Mid Life Guru - thank you so much! I always appreciate what you have to say. Tori - thank you so much! Vanessa - thank you! I hope you come see it, you would like it. Holly, thank you! Can't wait for you to see it! Lindsey - thank YOU. You have been an integral part of the process, and I'm blessed to know you and call you my friend. Emily - thank you, my friend. I appreciate you and your support, I can't wait for you to see the show! Unknown - thank you! Those are good memories. Josh - thank you so much. (I bawled while writing it.) I can't WAIT for you to see this show. Kelly M - awesome! Stick around after the show & say hello! mylittlegems - cool! I hope your sister has the time of her life in NYC. The Hale is great. Christi - thank you! Are you still singing? I remember loving listening to you sing. Ellen - thank you so much! Best wishes to your daughter. Naomi - thank you! That ocean...it gets in the way of all our plans, doesn't it? Jen - thank you! I hope you do come see the show!